Come along with Chris Dorsey to the best wingshooting destinations in Europe, Africa, Mexico and South America. This entertaining and perceptive look at wingshooting describes the hold the sport has on millions of hunters throughout the world through its celebration of favorite fields, fine guns, trusty dog and the camaraderie of treasured friends. The author, a lifelong wingshooter, also reveals practical professional tricks for hiring booking agents and guides, choosing the right locale and equipment, packing and transporting firearms properly and legally, practicing safe preventive medicine and deciding whether to take your dog (or spouse) along for the hunt. 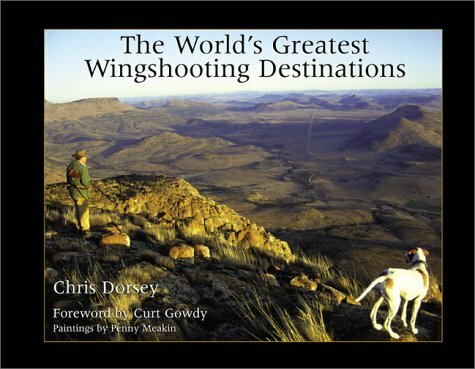 Featuring a foreword by renowned journalist and sportsman Curt Gowdy, gorgeous paintings by wildlife artist Penny Meakin and stunning color photographs and maps, The World's Greatest Wingshooting Destinations will make a handsome addition to any sportsman's library. 11 x 8 1/2, hardcover, original paintings, color photos and maps, 176 pp.